lifting loads. This hitch is commonly used to hoist heavy loads from ships. The double line provides strength and due to the twisted loops, should one side of the double line break there is a good chance that the other side will hold tempoarily so that the load can be lowered to the ground. 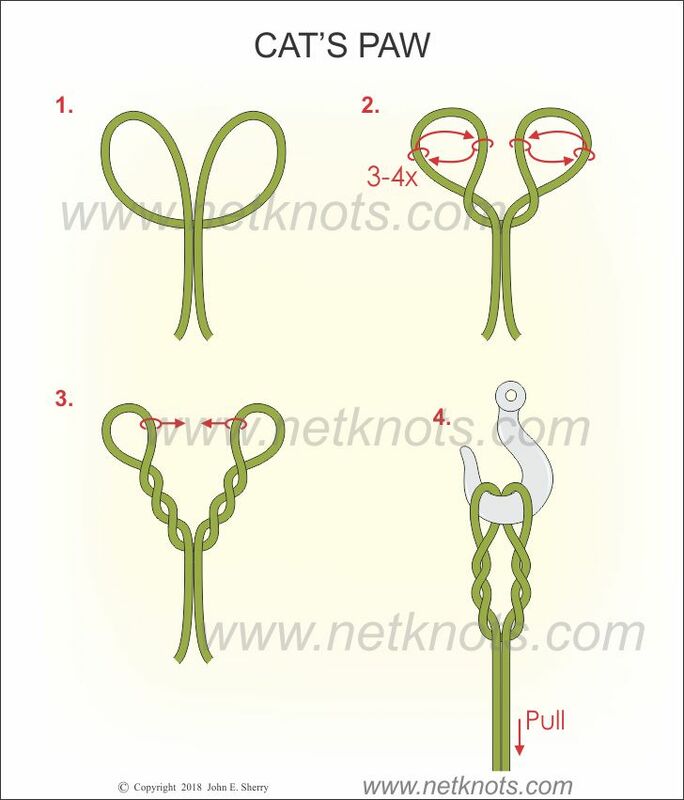 See animated Cat's Paw below the knot tying tutorial. Form a bight with a closed strop or you can form a loop in doubled line. Open the bight and tuck it under the standing line. This creates a pair of loops on either side of the double line. Twist the left side loop clockwise and the right side loop counter clockwise for three or four turns. Be sure to make the exact same number with each loop. Insert the hook or other device through both of the twisted loops. Pull on the standing lines to snug the turns up against the base of the hook or other device.